Furio Gustav Klimt 19pc & 17pc Dinner & Salad Plates. Furio Gustav Klimt dinner plates 3 of 8 total of 17pc set. 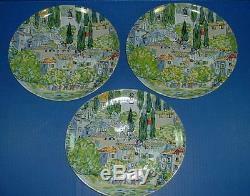 Furio Gustav Klimt dinner plates 5 of 8 total of 8 dinner plates in 17pc set. Furio Gustav Klimt signature on salad or dessert plates. Furio Gustav Klimt signature on all dinner plates in both sets. Furio Gustav Klimt dinner plate and salad or dessert plate in group. Furio Gustav Klimt salad dessert plates 4 of 9 in 17pc set. Furio Gustav Klimt salad dessert plates 5 of 9 in 17pc set. Furio Gustav Klimt 4 of 12 dinner plates in 19pc set. Furio Gustav Klimt 1 of 7 salad or dessert plates in 19pc set. Furio Gustav Klimt 2 of 7 salad or dessert plates in 19pc set. Furio Gustav Klimt 4 of 7 salad or dessert plates in 19pc set. Gustav Klimt was born in 1862 in Vienna, Austria and died in 1918 in Vienna, Austria. Klimt was an Austrian symbolist painter his works includes paintings, sketches and. Elaborate graphic schemes of murals plus other art work. The Furio plates and bowls show a small fraction of the Gustav Klimt portrait of the. Church of Cassone also known as Landscape with Cypresses that is in the village of. Cassone near Lake Garda in Italy and is done in blues and greens. 19-piece set Furio Gustav Klimt Church of Cassone a. Landscape with Cypresses 12-oval dinner plates showing a small piece of the Church of Cassone portrait, the. Plates are 11 ¼-inches in diameter 7-oval salad or dessert plates showing a small piece of the Church of Cassone portrait. The salad or dessert plates are 7-inches in diameter I have taken photos of both the front and back of both sizes of plates plus Gustav. Klimts name that is on each plate. All the Furio Gustav Klimt dishes were found of all places at an estate sale. That the previous owner was a collector which is why the dishes have no cracks, crazing. Previous owner is deceased and I cant verify if they are new. The dessert or salad plates are very hard to find even the large replacement outlets. Doesnt have them in stock. They will be packed with professional dish pouches that will be separated with. Cardboard squares and Styrofoam sheets lining all sides of the boxes plus Styrofoam. Also, both boxes will be insured for the full value. Dinner Plates: 28lbs 9oz-228.00, Salad or Dessert Plates: 8lb 14oz, 181.93. Weight and size of dinner plates. The stated weights includes the dishes and all of the. 17-piece set Furio Gustav Klimt Church of Cassone a. Landscape with Cypresses 8-oval dinner plates showing a small piece of the Church of Cassone portrait, the. Plates are 11 ¼-inches in diameter 9-oval salad or dessert plates showing a small piece of the Church of Cassone portrait. The salad/dessert plates are 7-inches in diameter I have taken photos of both the front and back of both sizes of plates plus Gustav. Klimts name that is one each plate. All the Gustav Klimt dishes were found of all places at an estate sale. The previous owner was a collector which is why the dishes have no cracks, crazing or. The dessert or salad plates are very hard to find and even the large replacement. Outlets dont have them in stock. They will all be packed with professional dish pouches that will be separated with. And size of dinner plates. The stated weights includes the dishes and all of the packing. All previously loved (PL) clothing/toys have been cleaned/sanitized by Nannas Closet before reselling. There are no rips, tears, stains or imperfections unless previously noted. Be sure to add me to your favorites list. IF I DO NOT GET FEEDBACK FROM THE WINNER please communicate! The item "Furio Gustav Klimt 19pc, 17pc Dinner Salad Plates Church of Cassone" is in sale since Monday, April 25, 2011. This item is in the category "Home & Garden\Kitchen, Dining & Bar\Dinnerware & Serving Dishes\Plates". The seller is "nannascloset6307" and is located in Aubrey, Texas. This item can be shipped worldwide.